Agricultural markets have entered a long-term process of liberalization, with the aim of reducing imposed market imperfections such as monopolistic public trade, entry barriers and subsidies. The experience of more than a decade of agriculture liberalization offers a good opportunity to review and analyze the outcome of this process and to draw lessons for the future. 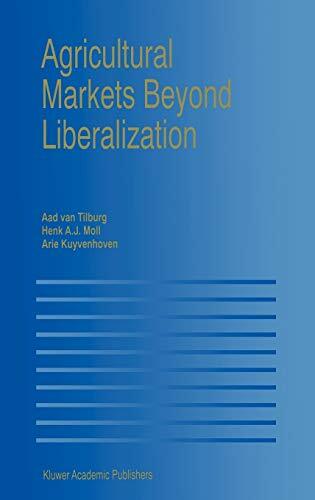 The central topic in Agricultural Markets Beyond Liberalization is the relationship between market structure and how markets perform in a dynamic context during a liberalization process. The topic is studied from both a micro and macro viewpoint and refers to different types of agricultural markets. This volume brings together the dynamics of agricultural markets in several parts of the world, with a special focus on transition economics and Africa. The different studies cover geographical areas as wide as a district as well as a group of countries, and institutions from individual contracts to multi-national organizations. The analysis of liberalization under different circumstances, and the different methods of analysis used by the authors provide a valuable foundation for the assessment of liberalization.